Osteoarthritis, often referred to as degenerative arthritis, is a non-inflammatory disease affecting predominately weight bearing joints like the knee and hip. It is not merely a disease of bone but represents a spectrum of degenerative disorders affecting one or more of the following joint components: bone, articular cartilage, meniscal cartilage, ligaments (the fibrous material that connects bone to bone), the joint capsule and synovial fluid, and, lastly, the pericapsular muscles and tendons. As opposed to rheumatoid arthritis, which is an inflammatory condition that primarily affects non-weight bearing joints, osteoarthritis develops from the cumulative wear and tear of biomechanical forces directed on weight-bearing joints over time. It is exceedingly common, affecting roughly a quarter of Americans older than age 55, occurring disproportionately in women. Osteoarthritis is the leading indication for knee replacement surgery, performed some 670,000 times a year in the US, with another 200,000 hip replacement surgeries. Think of knee and hip replacement surgery for osteoarthritis as akin to gastric bypass surgery for obesity; the goal is to never get to the point where such a radical approach represents the best treatment option. Obesity, by the way, is the leading risk factor for osteoarthritis in the first place. The typical weight of patients I see in the ER averages about 240 pounds for men and 200 pounds for women. That’s a lot of extra stress on the hips and knees, but because people don’t feel their body weight in the same way they might if asked to carry a sandbag atop their shoulders all day, folks typically ignore the strain until pain intervenes. Unfortunately, at that point, it’s too late. There is no cure for osteoarthritis. Just this week I saw an article in my local paper about the blasé manner in which most diners have greeted the new salt warnings required in NYC restaurants. Said a 20-year old nurse, “For someone that’s young, it really doesn’t matter, because they’re still healthy.” The implication being that once she becomes unhealthy she’ll stop eating so much salt. This is like smoking only until you get cancer. It doesn’t work that way. The same is true for osteoarthritis. Patients come to my ER every day with chronic arthritis pain wanting narcotics and MRI scans, neither of which is indicated to treat or diagnose their condition. The ER has nothing to offer them. Narcotics aren’t even effective analgesics when it comes to arthritis pain. A Cochrane Collaborative review of 22 trials involving nearly 8,300 patients found narcotics produced only trivial, non-clinically significant differences in pain perception and functional mobility. Alternatively, the risk of addiction is high. Many people fail to understand, or simply ignore the fact, that addiction occurs regardless of why the drug is taken. Whether for recreation or for pain matters not at all—take enough narcotic and addiction is the certain result. In the Cochrane review, 1 in 40 patients issued a narcotic prescription experienced withdrawal symptoms upon completion. The study wasn’t designed to determine the number who ultimately became addicted, but I see addicted patients every day, the majority hooked on prescription pain medicines issued for chronic pain. Overdose is now the leading cause of accidental death in this country, having surpassed motor vehicle accidents a couple of years ago. Marijuana isn’t the gateway drug to heroin: Percocet is. I am not trying to stigmatize pain sufferers, only to note that the slope becomes slippery once narcotics enter the picture. Regular physical activity and individualized exercise programs (including muscle strengthening, cardiovascular activity, and flexibility exercises) can reduce your pain, prevent worsening of your osteoarthritis and improve your daily function. If you are overweight and have osteoarthritis, it will be beneficial to lose weight and maintain a healthy weight throughout an individualized plan involving dietary changes and increased physical activity. Your osteoarthritis symptoms can often be eased significantly without requiring an operation. Living a sedentary lifestyle could worsen your osteoarthritis and also increase your risk of other lifestyle-related diseases such as diabetes and cardiovascular disease. Individualized exercise is an integral component of treatment for everyone with osteoarthritis. Maintaining sufficient muscle strength around the joints is important in reducing pain and maintaining function, and if you require an operation will benefit both pre- and post-operative periods of your treatment. Nondrug treatments have similar benefits for your osteoarthritis symptoms to pain relieving drugs, but with very few adverse side effects. Linking your individualized exercises to your other daily activities is a useful way to become more active. Individualized exercises work for your osteoarthritis only if you do them regularly. Actively taking part in self-management programs could benefit your osteoarthritis. I love this list and not just because it reinforces my own biases. First, the statements are evidence based. Second, the panel included both experts as well as patients (to my knowledge, the first time patient opinions have ever been solicited in this way). Third, the list is empowering. To improve your condition requires only a bit of training and discipline. Pain reduction isn’t dependent on technology or pharmaceuticals. There’s no mention of MRI scanning in any of the 21 statements. NSAIDs are mentioned only to condemn their long-term use (“You should avoid the use of nonsteroidal anti-inflammatory drugs for your arthritis over the long term.”) Non-joint replacement surgery is discouraged (“Arthroscopy that involves washout of the joint and joint scraping should not be used to treat your pain unless there is a mechanical blockage of your joint.”), while joint replacement surgery is advocated only as a last resort (“If you cannot achieve pain relief from your osteoarthritis, have undertaken a sustained period of recommended conservative management, and it is very difficult to perform activities of daily living, joint replacement is an option.”). None of the essential statements concerns the use of opioids. That’s because their use should be avoided altogether. 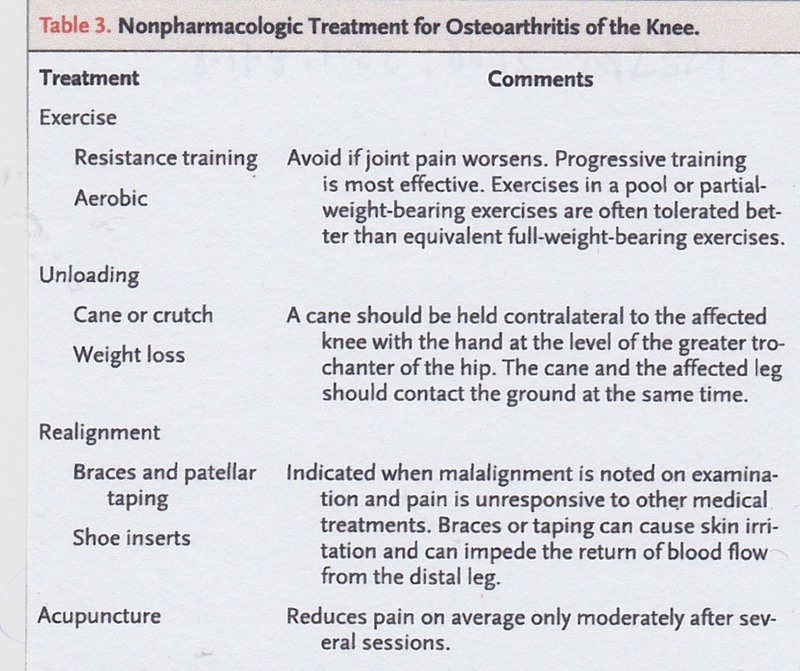 In fact, patients need to know that there are no effective pharmacologic interventions for osteoarthritis. (Sorry folks, no pixie-dust.) For those who insist on taking something, all the guidelines recommend acetaminophen (Tylenol) as the first agent to try in doses up to 4 grams per day. Acetaminophen is—at best—a weak pain reliever, working only marginally better than placebo. Next up are the COX-1 and COX-2 inhibiting NSAIDs like aspirin, ibuprofen (Motrin, Advil), naproxen (Naprosyn, Aleve), meloxicam (Mobic), and celecoxib (Celebrex). Since osteoarthritis is a non-inflammatory disease, there is no reason to think that anti-inflammatory drugs should work well, and they don’t. Chronic osteoarthritis pain needs to be differentiated from acute inflammatory pain due to overuse where a few days of generic ibuprofen or naproxen often provides relief. What about chondroitin and glucosamine? Both are available as over-the-counter nutritional supplements, usually packaged together. They are key constituents of proteoglycan molecules that interact with collagen to form the matrix that gives cartilage its unique shock absorbing capacity. A large New England Journal of Medicine trial comparing the supplements to placebo and Celebrex over a 24-week test period in osteoarthritis patients found that chondroitin and glucosamine worked no better than placebo and worse than Celebrex at providing a 20% reduction in knee pain. Cochrane reviews of the supplements and a JAMA meta-analysis of published trials determined that the benefits in pain reduction and improvements in function are minimal. They likely work as well as NSAIDs but without the side effects, so if you want to try something for a few months go ahead and give a chondroitin/glucosamine supplement a whirl. There is limited data that intra-articular injection of hyaluronic acid derivatives and/or steroids helps to improve function and reduce pain over the short term, but neither provides long-term analgesia or halts progression. That leaves exercise! People often complain that their pain precludes exercise, but a study of seniors with knee osteoarthritis found that simply walking for 40 minutes or performing a series of weight training exercises with as little as 2.5 pounds three-times weekly significantly reduced disability over 18 months of follow up. Although it sounds paradoxical, the best way to reduce joint pain is by continuing to exercise the joints involved. For those who can’t tolerate running, try walking, cycling, skating, eliptical training, cross-country skiing, or pool aquatics. Visit a mall, find a treadmill, or walk through the woods—all provide long lasting benefits. Last word: Stop looking to physicians for pharmacologic and surgical cures and start looking in the mirror. You are the person best able to help your osteoarthritis pain. And that is very good news indeed. Stay healthy my friends! Simon French et al., “What Do People With Knee or Hip Osteoarthritis Need to Know? An International Consensus List of Essential Statements for Osteoarthritis,” Arthritis Care and Research 2015; 67 (6): 809-16. David Hunter and David Felson, “Osteoarthritis,” BMJ 2006; 332: 639-42. David Felson, “Osteoarthritis of the Knee,” NEJM 2006; 354: 841-8. Nancy Lane, “Osteoarthritis of the Hip,” NEJM 2007; 357: 1413-21. Verena Dobnik, “Ignoring the Salt Warning Labels,” March 12, 2016, West Side Spirit, www.westsidespirit.com. R. da Costa eta al., “Oral or Transdermal Opioids for Osteoarthritis of the Knee or Hip,” Cochrane Database of Systematic Reviews 2014; Issue 9, Art. No. CD003115, John Wiley & Sons Ltd.
Daniel Clegg et al., “Glucosamine, Chondroitin Sulfate, and the Two in Combination for Painful Knee Osteoarthritis,” NEJM 2006; 354: 795-808. Florent Richy et al., “Structural and Symptomatic Efficacy of Glucosamine and Chondroitin in Knee Osteoarthritis,” Arch Intern Med 2003; 163: 1514-22. A. Singh et al., “Chondroitin for Osteoarthritis,” Cochrane Database of Systematic Reviews 2015; Issue 1, Art. No. CD005614, John Wiley & Sons Ltd.
Towheed et al., “Glucosamine Therapy for Treating Osteoarthritis,” Cochrane Database of Systematic Reviews 2009; Issue 2, Art. No. CD002946, John Wiley & Sons Ltd.
Brenda Pennix et al., “Physical Exercise and the Prevention of Disability in Activities of Daily Living in Older Persons With Osteoarthritis,” Arch Intern Med 2001; 161: 2309-16. Marlene Fransen et al, “Exercise for Osteoarthritis of the Knee,” Cochrane Database of Systematic Reviews 2015; Issue 1, Art. No. CD004376, John Wiley & Sons Ltd. This entry was posted in Uncategorized and tagged arthritis, hip osteoarthritis, knee osteoarthritis, osteoarthritis. Bookmark the permalink. ← I’m skeptical about … antibiotics. Very interesting and well written as usual…and I agree and have always said percocet is the gateway drug! Not marijuana!